Facebook has announced plans to sunset several metrics from its ad platform, replacing them with alternatives that will offer better insights into overall ad performance. As the platform has evolved over time, Facebook has found that some metrics are not as valuable as they could be, so they’re making adjustments to help advertisers make more informed decisions. The main change is to their ad relevance score, which is being separated into three separate measurement tools. In addition, several more metrics are being re-introduced with minor changes that provide more actionable insights. Facebook’s relevance score measures how relevant your ads are to the people in your target audience compared to other ads targeting that same audience. Currently, your relevance score is calculated using various factors that indicate positive feedback (i.e., clicks, app installs, video views), and negative feedback (i.e., someone clicking “I don’t want to see this”). This feedback is compiled to create one single ad relevancy metric, which is represented as a score between 1 and 10. Because the tool is collecting data from so many different aspects of user behavior, Facebook felt that one single metric doesn’t necessarily tell the whole story when it comes to analyzing why your ad scored the way it did. So, Facebook will be sun-setting the original relevancy metric on April 30th, replacing it with three new “ad relevance diagnosis” metrics that measure relevance across three dimensions of user behavior, offering more granular insights. Quality Ranking: How your ad’s perceived quality compared to ads competing for the same audience. Engagement Rate Ranking: How your ad’s expected engagement rate compared with ads competing for the same audience. Conversion Rate Rank: How your ad’s expected conversion rate compared with ads that had the same optimization goal and competed for the same audience. 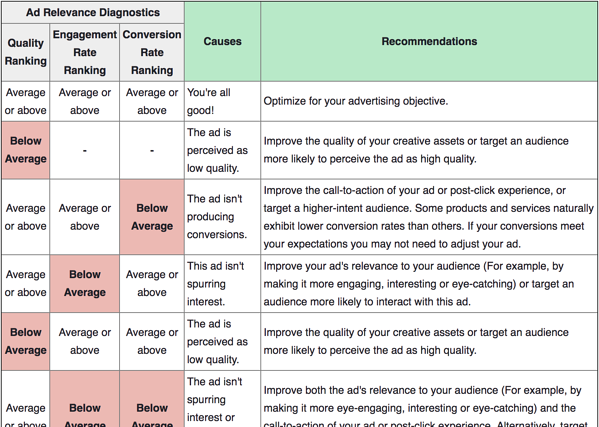 Like the name states, these ad relevance diagnosis tools help advertisers actually diagnose their relevancy score instead of simply viewing how it’s being perceived. These metrics provide clearer, more actionable insights on ad performance. When used together, marketers can understand if an under-performing ad needs different creative assets, improved targeting, or if the post-click experience needs to be changed. To help marketers translate these metrics into data-driven decisions, Facebook created a chart detailing different score combinations, what they could mean, and recommendations for improvement. You can view the full chart here to view all scenarios. Like the existing relevance score, the three ad relevance diagnostics are not factored into an ad’s performance in the auction, but used for reporting purposes. Facebook has not given a solid roll-out date for the new relevancy metrics, just stating that they will begin rolling out “in the coming weeks”. However, the previous relevancy score will start to phase out on April 30th – so marketers should evaluate any existing reports that utilize this metric over the next few weeks. While the main news was the three new relevance tools, Facebook also announced they’re sun-setting six additional ad metrics around the same time, replacing them with items their team felt were “more actionable” based on feedback. Why are they being removed? Advertisers requested more visibility into when any ad type was being saved, beyond just Offer Ads. Clearly, when someone is bookmarking your post, it’s a signal they’re interested in your campaign, so it’s an important metric to be aware of. What are they being replaced with? Post Saves This metric is more inclusive for measuring how many users are saving your ads. Post saves displays the number of times users are saving any ad, Offer or otherwise. What did they do? Displayed the number of replies your messages received. Why are they being removed? Feedback showed that the messaging replies metric didn’t provide a lot of value to marketers. Instead, they were more interested in how many new conversations were being started by people that had never messaged the company before, or by people who messaged after a period of inactivity. New Messaging Connections – This metric only includes new conversations started by users with no previous engagement with your brand. What did they do? ROAS refers to “return on ad spend,” allowing businesses to view the revenue they’re generating from their ad efforts from mobile app vs. web. Why are they being removed? As buying behavior has evolved, Facebook found that “the customer’s path to purchase is increasingly omnichannel,” meaning their behavior may span across both web, mobile, and tablet as they decide to make a purchase. For that reason, the metrics need to reflect this behavior to paint the full picture. What are they being replaced with? Purchase Roars. This is the same measurement – return on ad spend – now aggregated across channels. This way, marketers can better understand the true ROI of their advertising efforts without accounting for this cross-channel behavior. Enugu Contends with Aba in leading digital entrepreneurship.